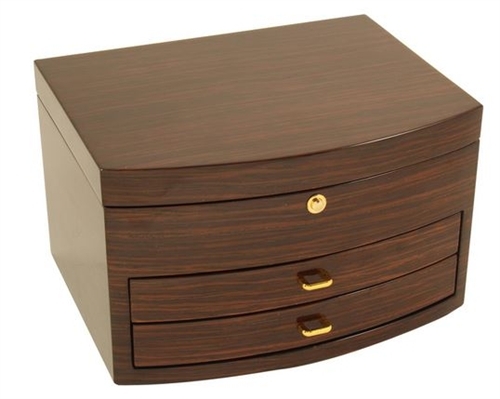 Large dresser top jewelry box in ebony wood. Mirrored top, multi-sized compartments, two drawers, push button latch for top. 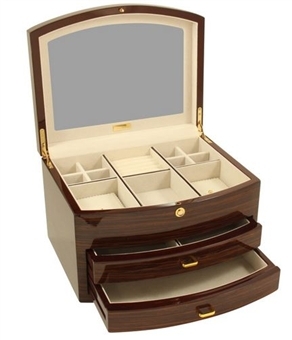 Terrific gift for someone with a normal-sized jewelry collection including necklaces and multiple watches! The shipping estimate on a mother's day/ anniversary gift I had purchased was not correct and it arrived in 6 business days when 3 was advertised. Further, I checked the box to expedite as necessary at my cost. This was not done and no attempt was made to contact me. I spent a lot of money here only to be empty handed on the big day.